Most of the fitness users want to get a beautiful flat belly. Conventionally, the muscles can be divided into upper, lower press and lateral. 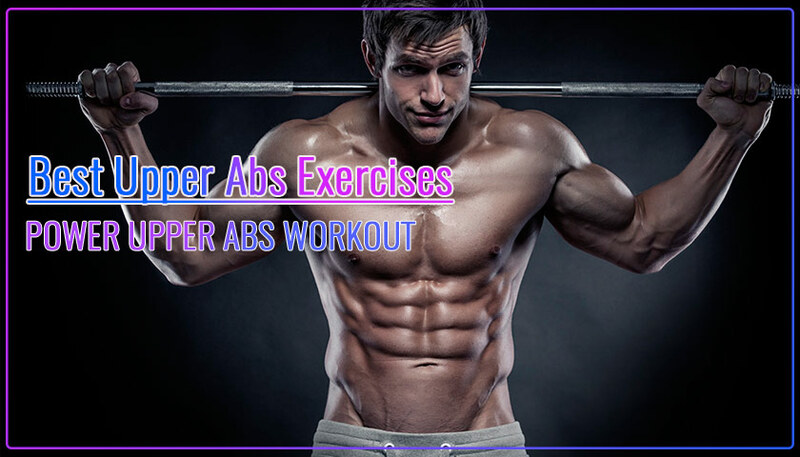 In this article we will present 12 Best Upper Abs Exercises. We will not only indicate the technique of the exercises, but also give recommendations on how to combine them more effectively in the training program. To perform all these exercises you will need: a fitness Mat, a ball, dumbbells or a kettlebell, a bench, a roller for the press. But that’s not necessary. You will be able to make a varied training program even if you do not have all this equipment. Do not think that for Six-pack Abs enough training. To make your muscles visible it is necessary to reduce the percentage of subcutaneous fat to 6-8 %. Ideally, you need to train not only the muscles of the press, but the whole body. Also follow a diet and lead a healthy lifestyle. Let’s begin. First of all, let’s consider the technique of performing exercises. For this exercise you will need a large ball. Becoming in a position push ups legs have quads on top of the ball. The body should be approximately parallel to the floor. Hands better to put wide for greater stability. Twisting the body raise the hips. The ball moves in the direction of the hands until it is at your shins. Then make the reverse movement. It is important to perform the exercise slowly so as not to lose stability. Lie down on the floor, legs bent at the knee. Arms stretched above the head and join the palms. Lifting the body hold evenly. On one level must be hands, head, shoulders. We rise on completely. This is important for Abs Upper load. You also need to pause at the top. Go down to touch the back of the floor, do not lie down completely. This will keep the muscles in tension. While you have the strength to move on to the next interesting exercise. Initially, you can perform this exercise without additional weights. Further dumbbells or dumbbells will allow you to use additional muscle stabilizers. Sit on the floor, bend your legs and put them on the floor. Keep your back straight. Perform simultaneous movement lifting legs and feed the body forward. Keep your legs bent. After a minimum pause, lower the legs almost to the floor, not lowering them completely. The body is lowered to touch the waist, but do not lie down. Freeze for a split-second and rise again. When you can easily perform this exercise, use the dumbbell. Taking her to one of the hands do this exercise. You will need extra effort to keep the balance. This exercise will require a bench. It is optimal to use an inclined bench with adjustable angle. If such equipment is not available, you can perform such an exercise lying on the floor, near any support to be able to take up arms. I started using this exercise after watching Rocky. Something like that was used there. Since that time for me it is one of the best upper Abs exercises. Set the angle of the bench. Lie back on it and hold both hands on the bench above your head. Lift your legs and hold them parallel to the floor. Perform lifting until the buttocks and lower back will not rise up. after a short pause, slowly lower your legs down until they are parallel to the floor. Do not lower your legs completely. Perform the required number of repetitions. It is important to perform the exercise slowly so as not to rock the bench. This exercise is performed with a rope. It is fixed on a high pulley. For convenience, it is better to use a fitness Mat. Kneel down, hips bent. Take the rope and lower it to the level of the face. Performed by twisting. Hands remain slightly bent at the elbow. We descend by reducing the muscles of the press to the touch of the elbows of the hips. Pausing one second begin to reverse movement. It is important to return to the starting position as slowly as possible and not to relax the muscles of the press. Take a big ball and a fitness Mat. Lie on the floor on your back, place your feet on the ball. The back should only touch the floor with the shoulder blades, the lower back is raised. Hands can be put on the floor a little apart. They will provide balance. Lifting the body up bend the legs in the knee to an angle of 90 degrees. The ball pull up to itself. Keep your lower back straight. Pausing for a second, slowly return to the starting position. To start the exercise, let’s hang on the bar. Legs together raise the maximum up to touch the horizontal bar. It is advisable to keep them together and not bend in the knee. The downward movement is performed as slowly as possible. Then perform the required number of repetitions. If you can not raise your legs to the crossbar perform the rise to an angle of 90 degrees. You can also perform alternate leg lifts. Keep your feet up for as long as possible. For exercise, we use a flat bench. Lie down on her back to the waist was at the end of one of the edges of the surface of the bench. Keep your feet parallel to the floor. Hands are placed along the body. With the effort of raising legs to 90-degree angle with the body. Then slowly lower your legs to the starting position. Make the desired number of repetitions. If the exercise seems too easy, pause for one second while lifting your legs. Raised legs to 45 degrees in 1 second, then another rose to 90 degrees, pause again for 1 second. The reverse movement is similar. Everyone knows this exercise. A feature of the upper abs exercises is the position of the body. For greater emphasis on the load on the desired muscle group we use the bench. Or you can use the ball. But in this case it will be necessary to keep the balance. For this exercise you will need a kettlebell or a pancake from the rod. Lie back, the body slightly raised. Feet are on the floor bent at 90 degrees. Take the kettlebell with both hands in front of him at the breast. Twisting is performed to reduce the upper abs muscles. It is important to pause in this position for 1 second. Return to the starting position. Exercise is quite simple, but the use of additional weight can increase endurance. Lie on the Mat on your back. Legs raised up at a 90-degree angle. They can be slightly bent at the knees. Before a show of hands fingers up. This will be the starting position. Slowly raise the body and stretch your fingers to the feet. The body rises to 45 degrees from the floor. Then slowly lower the body to its original position. To simplify the exercise, you can ask the assistant to hold his feet, or lean them on the wall. To complicate the exercise in your hands you can take a dumbbell. It is important to keep the body in balance and not to sway. The move by cutting the abdominal muscles. You can choose any exercise you like for your training program. Or to be guided by the available equipment. In any case, training is more than enough. To see at least some noticeable need to perform abs workout 30 days at least. WHAT EXERCISES TARGET UPPER ABS? Almost all of these exercises are aimed at upper abs. A smaller part of them includes almost all muscle groups. IS IT BETTER TO DO ABS OR CARDIO FIRST? Depends on your training style. I have two versions of the workout of the abdominal muscles. Easy training that follows after other muscle groups. Or heavy when I combine the workout of the hands or shoulders, and three-dimensional abs workout. WHAT ARE THE BEST AB WORKOUTS TO GET A SIX PACK? WHAT WORKOUT GIVES YOU ABS THE FASTEST? It is necessary to combine abs workout and cardio exercise. Watch your diet. In training, you need to observe regularity, giving a full recovery of muscles. There is no specific set of exercises that work best. In addition, not all exercises are suitable for beginners. Some exercises will require additional equipment. It is optimal to choose 3-5 exercises of different types and periodically replace them to experience the necessary stress. Either way it will be abs workout 30 days no less. HOW CAN I MAKE MY ABS STRONGER AT HOME? Sure you can. Even perform only exercises without equipment but exercising regularly you will be able to achieve results. It won’t be as fast as we’d like. But it is necessary to be persistent and you just can. It’s time to think about the beauty of your press. This is one of the best motivators to go in for sports. Summer is coming soon) Thank you for this review.